Montreal is a special city made up of many cultures. Montrealers shift between French and English and numerous other languages on a daily basis with greased ease at a mesmerizing pace. Though Montreal’s streets, restaurants, bars and other venues have more bilingual ease, our theatrical entertainment has largely remained divided between the solitudes. 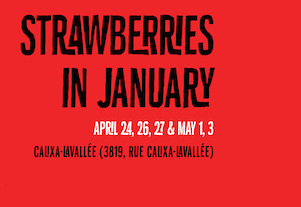 This past Thursday Strawberries in January, a bilingual play, opened at the Centre Culturel Calixa-Lavallée in Parc Lafontaine and will alternate with nights in English and French until May 3rd. Strawberries in January is a modern romantic comedy about the intertwined adventures of four characters whose paths intersect not only with each other but also with heartbreak and romance on their paths to finding happiness in love. Written by Montrealer Evelyne de la Chenelière (Public Disorder, Bashir Lazhar) and translated by her longtime collaborator Morwyn Brebner, the show had its English premiere on Thursday followed by the same actors (one play, two scripts) and crew doing the show in French on Friday. We were there on opening night and the show was a wonderfully uncomplicated telling of how complicated our romantic lives can seem. There were several highly relatable, laugh-out-loud yet tender moments and each character is given their share of standout moments. Without giving too much away, the best scenes involved telling off lazy students, a drunken ruining of a date, a young woman’s balancing act that teeters between crazy and confident when getting set up on a date and another character’s burning desire to return to the crowded streets of the wonderfully polluted city away from the chocking cleanliness of the country. It all works and you have to see it is get it. Strawberries in January (Des fraises en janvier) runs until May 3rd and you can get all the information about tickets, Persephone Productions and le Centre Culturel Calixa-Lavallée here.